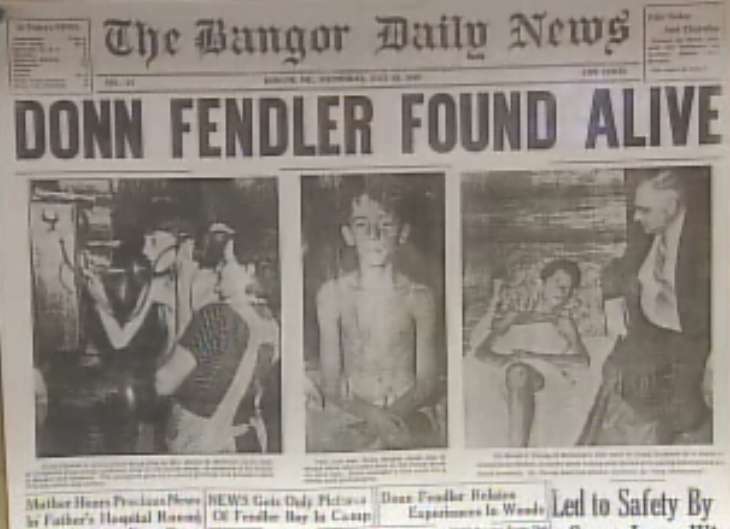 In 1939 twelve year-old Donn Fendler was hiking to the Summit of Maine's highest mountain when he became separated from his family. A dark storm enveloped the peak of the mile-high mountain called Katahdin, and the boy quickly lost his way. He spent nine long days and nights in that rugged wilderness, all alone except the wildlife he encountered as he tried to find his way out. Meanwhile, the entire state prayed for him while hundreds of brave citizens and blood hounds searched the mountain. It was these prayers, Donn's courage and faith, his Boy Scout training and his "will to live" that brought him through this ordeal. After a quick recovery from malnutrition and hundreds of scrapes, cuts, and insect bites, Donn was celebrated with a huge parade in Millinocket. He also met the President of the United States and was the subject of a story in Life Magazine. But the greatest tribute to this young boy's courage was publication of "Lost on a Mountain in Maine," the story of Donn Fendler told by Joseph Egan and enjoyed by young readers for almost 70 years. Donn Fendler is now living in Tennessee. He summers in Maine where he remains for a few weeks in the fall so he can visit schools across the state to share his story and answer kids' questions about his incredible experience. His memories are vivid and he always has a positive message for children about faith, courage, preparation, and the will to live. 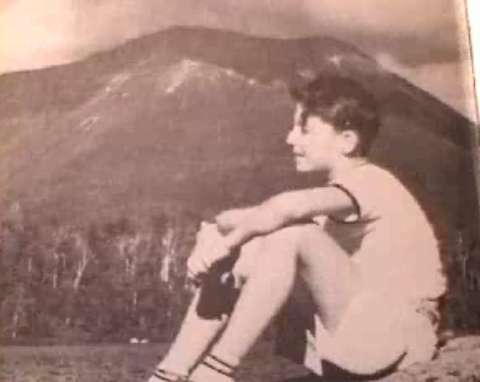 Since his brush with death in Baxter State Park more than seventy years ago, Donn Fendler has received thousands of letters, mostly from Maine school children, which he always answers. He still visits many Maine schools every year. Donn lives in Clarksville, Tennessee, but summers in Newport, Maine. 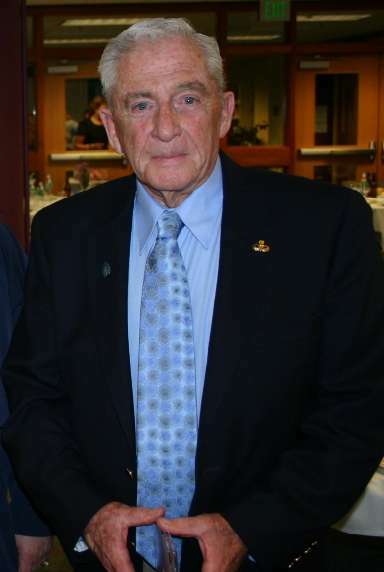 He attended Maine Central Institute, in Pittsfield, and the University of Maine. He is retired from the U.S. Army. Donn says his book was not dedicated to anybody, but if he was to dedicate the book today it would be to the Boy Scouts of America. His appreciation of Scouting is shown by his active involvement in scouting, attaining the rank of Life Scout. This web site was created and hosted by John Thurlow, a School Administrator in Scarborough, Maine and former teacher and Technology Integration Specialist in South Portland, Maine. It was created with Donn's permission in 2001 as a tribute to his contribution to education in Maine. 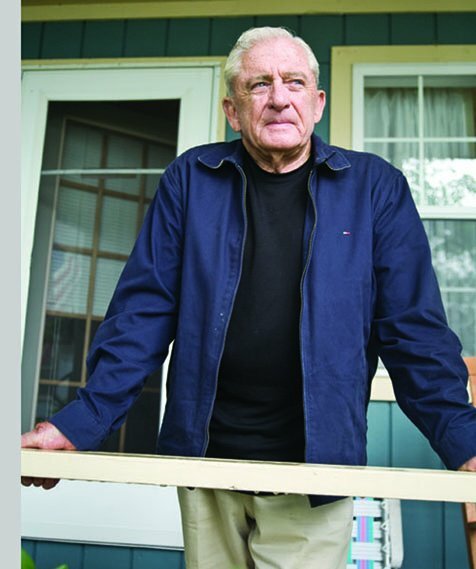 He has not only inspired generations of children with his story, but the talks he has given to thousands of kids over the years, and the countless letters he has replied to, have made profound contributions to education in Maine and elsewhere. Donn is in great demand as a speaker, and he tries to fulfill every request if he can. He visits fewer schools these days but appreciates the letters he receives and still replies to them all. Donn lost his dear wife of 56 years, Ree Fendler, in January 2009. Thank you, Donn, for being a wonderful role model for the children of Maine and the nation. 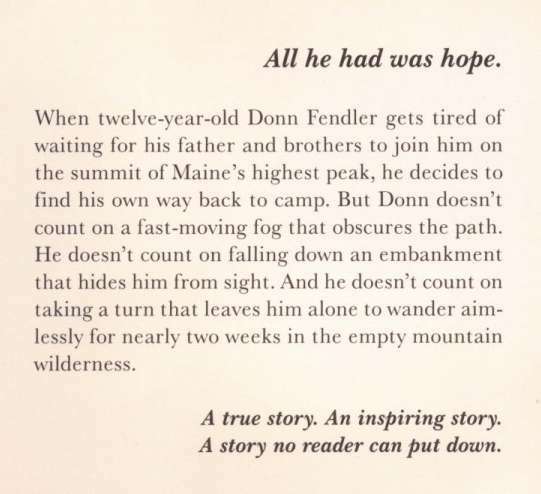 Donn's book now has a national following and we're proud of our own Donn Fendler, the boy who was lost for nine days in the Katahdin wilderness. And survived! We were saddened to learn that Donn Fendler’s beloved wife of 56 years passed away January 26, 2009 following a six week illness. Ree Fendler was a wonderful lady and our thoughts are with Donn and his family. Please read Mrs. Fendler’s obituary from the Bangor Daily News follows with information about memorial contributions. Online condolences can be left at a special guest book set up for the family at http://www.legacy.com/BangorNews/Obituaries.asp . 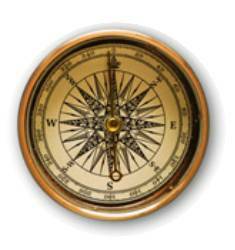 Use the search tool to locate the Guest Book.